Developed on a powerful and proven system that works particularly well for those suffering pregnancy loss or when IVF has failed, this report provides answers. Let me do the work for you! When you decide to take action and work with me, I'll identify exactly what you need to do to fast track your way to your health and guide you to heal. Stop fumbling in the dark. You are not the problem, the traditional model of fertility treatment is the problem! It's fundamentally flawed and broken! Experience less unsuccessful cycles and more chances of conceiving either naturally or with IVF with the NEW FERTILEZONE® fertility model. Pioneering the new science of FERTILEZONE®, BUMP® is the only fertility assessment that combines all fertility wellness components to give you a complete blueprint of what and how you need to change to become a parent. Developed on a powerful and proven system that works particularly well for those when IVF has failed, by working alongside me, you'll find answers and do away with trial and error prescribing. Discover your nutrient deficiencies, metabolic & toxin risks, health risks and personalized foods. 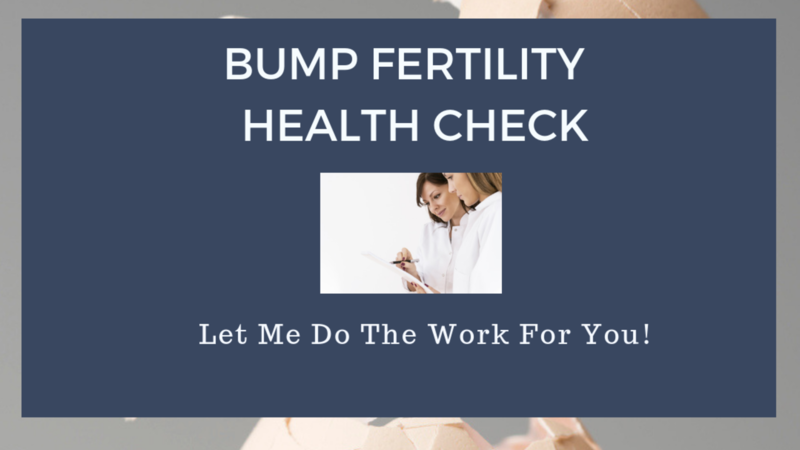 It's your roadmap for great fertility! Includes x1 Comprehensive Fertility Health Screen including environmental pollutants and hidden factors stopping you from becoming a parent.